Coveniently located in an ever growing neighborhood a step away from downtown, the headquarters of Issadesign are expending and reinventing themselves. Initiated since Spring of 2015, the reorganisation allows the separation between work space and the greet and meet point. Conceived on two floors, the new offices offer an inspiring and pleasant space for both clients and employees. On the first floor awaits a nest of creativity with at its center a long rallying conference table, surrounded by a selection of samples to inspire clients and contributors. Thanks to the cozy and intimate atmosphere, creation in symbosis and cooperation becomes completely natural. All dressed in white and bathing in natural light, the workshop on the second floor is ideal to focus on the ongoing projects and plans on the drawing table. 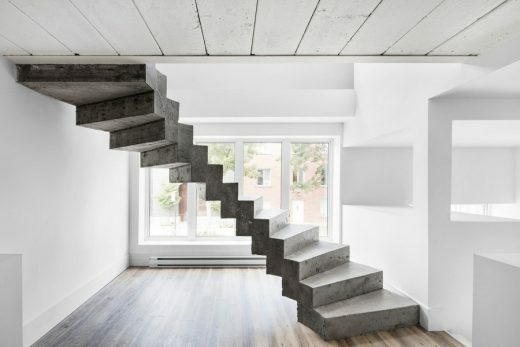 The broad structural concrete staircase connects the two stories and showcases both the aesthetic and tectonic direction of the company.